It was early on a recent July morning and the humidity hung heavy when the man who invented the microbrewery arrived at the Samuel Adams pilot brewery. He squinted his eyes against the sun and briefly looked up at the barrel shaped sign above the main entrance before walking inside to revive his New Albion Brewing Co.
Ladies and gentlemen, Jack McAuliffe is back. McAuliffe, a former Navy engineer, is credited with building and running the first modern American microbrewery. Founded in 1976, New Albion produced an English style ale, stout and porter. Bottles were hand filled and labeled, distributed in wooden crates and empties would later be returned to go through the process again. It was a novel concept for the era and soon the national media descended on the small Sonoma, California brewery that McAuliffe also occasionally called home. However he and the others involved were only able to keep it open for about five years before running out of funding. As is often the case with pioneers, McAuliffe found it difficult to convince bankers that his wild idea was worth longtime investment. They looked at him like he was from Mars, McAuliffe said. McAuliffe would leave the brewing industry and California and for a long time remained in relative obscurity until two years ago when the Sierra Nevada Brewing Co. asked him to come and brew a collaboration barley wine. Sierra’s founder Ken Grossman was inspired by McAuliffe and wanted to pay homage to the man who started a movement. That beer, Jack and Ken’s Ale was released to commemorate Sierra Nevada’s 30th Anniversary. Others had done their part to keep McAuliffe’s legacy alive. Jim Koch the founder of Boston Beer Co., makers of Samuel Adams said he took ownership of the trademark for New Albion in 1993, when it was about to expire, in order to protect the integrity of the first craft beer. In addition to preserve the name of the brewery, Koch also trademarked New Albion Brewing Co. However it wasn’t until 2011 that the men met in person. After McAuliffe’s Sierra ale was released Koch reached out and proposed reviving New Albion for a modern age. After months of negotiations and conversations, McAuliffe arrived at the Boston brewery on July 3, 2012 to mash in the first batch of New Albion Ale in 30 years. 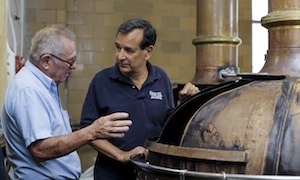 First, he had to hash out details with Koch and brewer Dean Gianocostas. The memories came mostly easy to McAuliffe who recalled temperatures, ingredients, and processes. While the brewers had sketched out a plan in advanced, but much was changed. “We should do it Jack’s way,” said Koch with wide eyes as he listened to McAuliffe recall the recipe. What they settled on was New Albion Ale, a pale ale “as faithfully” as McAuliffe could recall. Malt variations that replaced strains used in the 1970s were substituted, for example. Once the recipe was set and McAuliffe had thoroughly entertained the assembled staff and guests with stories from the old days, mash in happened at exactly 9:17 a.m. A few minutes later the public tours started at the brewery and since it was the day before Independence Day there were quite a few uniformed members of the military taking a stroll through the popular tourist attraction. When some active members of the Navy showed up, Koch and McAuliffe called them over, chatted them up a bit, posed for pictures and toasted with a beer. It’s been a good turn of attitude for McAuliffe who long shunned the spotlight and as recent as two years ago was dismissive when asked about his brewery that helped launch a revolution. But, after an appearance at the 2011 Craft Brewers Conference in San Francisco where he received a standing ovation, a positive reception a few months later at the Great American Beer Festival and a growing number of drinkers and brewers who have expressed their appreciation for his hard work, McAuliffe is allowing himself to enjoy the experience. Soon customers will be able to enjoy his beer. The New Albion ale will be served at special events during this year’s Great American Beer Festival in Denver. Then, additional batches of New Albion Ale will be brewed at a Sam Adams brewery (in either Pennsylvania or Ohio) and distributed nationwide in 12-ounce 6-packs starting in January 2013. This is designed to be a one-shot deal so when it’s gone, it’s gone. Great news! I can’t wait to have another New Albion beer it’s been too long!